Vegans blocked traffic at Flinders Street Station this morning. 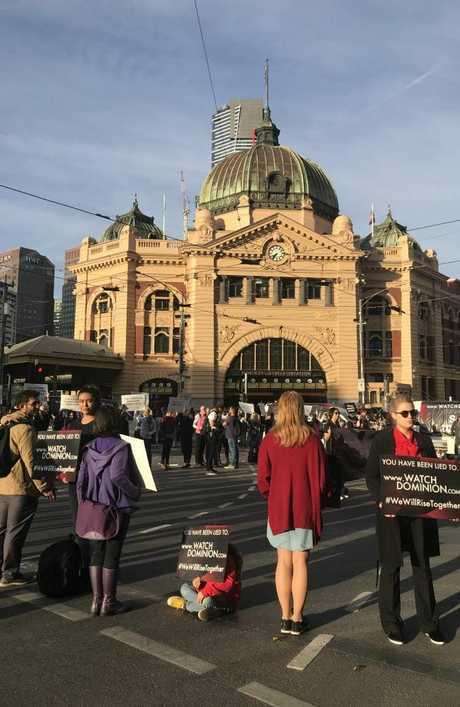 Melbourne's busiest interection has been completely blocked off by vegans conducting a "peaceful" peak-hour protest. 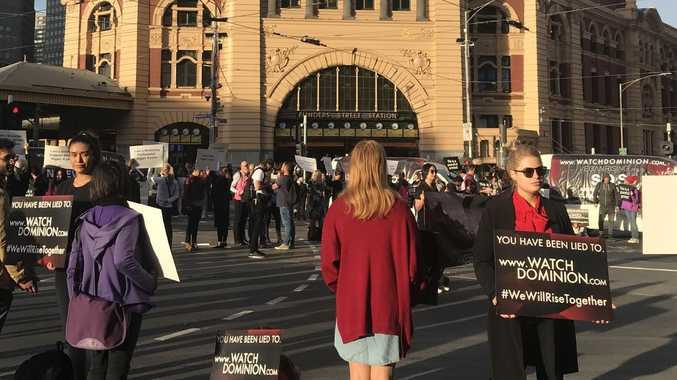 Hundreds of vegans from all over Victoria gathered at 5.30am outside Flinders Street Station holding signs and blocking cars and trams from passing through. Police officers are at the scene filming the protests but not intervening. It's part of a wave of action that includes activists blocking the entrance to the MC Herd abattoir in Geelong and chaining themselves to a truck in Pakenham, southeast of Melbourne. Protests are also being planned for Sydney, Brisbane and Hobart, but the exact locations are closely guarded. More than 100 vegans stood in silence at the corners of Swanston and Flinders streets during peak hour. 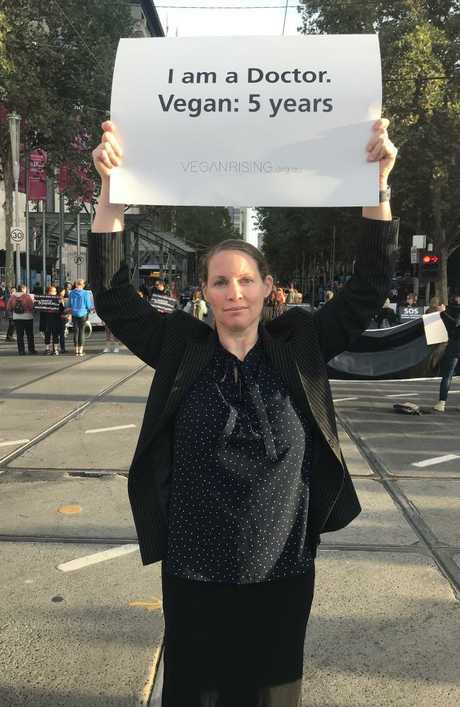 Last night, vegans gathered at Queen Victoria Market calling for an end to slaughterhouses and further action is expected throughout the day. 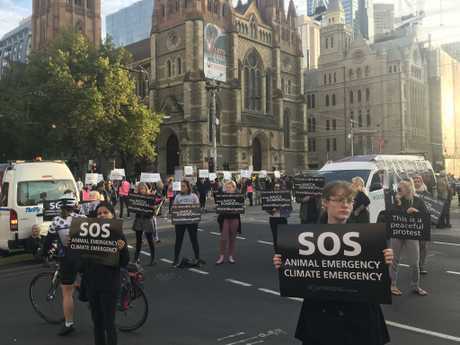 Prime Minister Scott Morrison admonished the animal activists as "un-Australian" on 2GB radio this morning, but vegans on the ground say they're "hard to argue with". Doctor of Paediatric Neuropsychology Helen Jeges held a sign above her head at this morning's protest on Flinders Street. It read: "I am a doctor. Vegan: 5 years". "We want to open people's eyes to what they're really paying for," Dr Jeges told news.com.au. "A lot of people don't know that if you buy eggs, male chicks are ground up alive. It's to raise awareness." She said the protests had not been met by hostility, but commuters were frustrated this morning when trying to catch trams through the CBD. "The response has been really great," Dr Jeges said. "We don't expect any antagonism. We represent kindness, equality, non-violence, and so it's hard to argue against that." The activists are trying to bring attention to the documentary Dominion on the one-year anniversary of the film's release. It shows footage inside Australia's abattoirs. 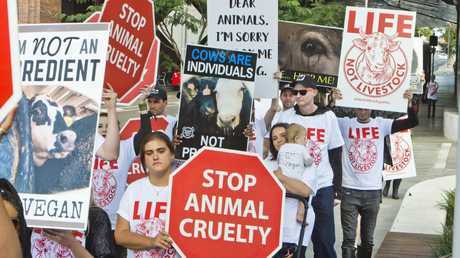 Already this morning, police have broken up a protest at a Queensland abattoir. Farmers across NSW and Queensland have also been placed on high alert as a number of groups plan to carry out a series of co-ordinated raids - which they say is "the biggest animal rights direct action the world has ever seen". The exact locations of today’s protests are being closely guarded. Up to 200 others remained outside the facility, protesting against what they said was the barbaric slaughter of sheep and pigs. There's no word of any arrests, and the protest was over by about 5.30am, about two hours after police were called to a break-in at the property. Brad King, from the activist group Farm Animal Rescue, was among those at the protest and said animals slaughtered at the site had endured terrifying deaths. "There are numerous occasions where they're not stunned properly, but even when they are, the footage unequivocally demonstrates that it's impossible to 'humanely' kill an animal who desperately doesn't want to die," he said in a statement. 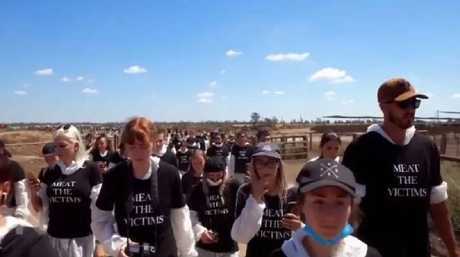 It comes as Queensland is beefing up powers to stop animal rights protesters invading farms for illegal and potentially dangerous protests that are stressing farmers already struggling after floods and drought. New laws are being drafted to allow police and agricultural officers to fine vegan activists whose activities risk the lives of farmers, workers and animals, says Mark Furner, Minister for Agricultural Industry Development and Fisheries. Animal activists say today’s action will be the biggest the world has ever seen. "Everyone has the right to protest, but nobody has the right to break the law," Mr Furner said in a statement on Sunday. Queensland farmers deserved respect and needed to be protected, he said. "Many of our farmers are already under great stress following years of drought and more recently the floods, and we are standing side-by-side with them," Mr Furner said. The Department of Agriculture and Fisheries will form a joint taskforce with the state police intelligence unit to focus on animal activism. Premier Anastasia Palaszczuk said the activists were coming mainly from interstate to cause Queensland farmers distress, and their activities were also impacting the export industry. Mr Furner said the taskforce and fines were being designed to act as a strong deterrent to unlawful behaviour. The move comes after Federal Agriculture Minister David Littleproud has been calling for higher fines from states. He has also been calling, so far unsuccessfully, for one animal rights group to pull down a controversial map of farm locations the minister calls an "attack map". The Aussie Farms Map says it is a comprehensive, interactive map of factory farms, slaughterhouses and other animal exploitation facilities across Australia. It lists the exact co-ordinates of people's home businesses and other details, such as ABN numbers, that can be used to find more personal details about the owners.